Sea Shepherd founder and veteran environmentalist arrested on charges relating to Costa Rican shark-finning operation. The environmental activist organisation Sea Shepherd said Paul Watson had been detained at Frankfurt airport to answer a Costa Rican extradition warrant for "violating ships traffic". The incident took place in Guatemalan waters a decade ago when Watson's boat, the Farley Mowat, encountered an illegal shark-finning operation run by a Costa Rican ship, the Varadero. Crew on the Varadero accused Watson of attempting to ram their boat and Watson was charged by Costa Rican authorities with attempted murder. Watson's charges were subsequently dismissed when a video of the incident filmed by a documentary crew was shown to the Costa Rican prosecutor. However, the charges were later re-investigated by a newly appointed prosecutor. Established by Watson in Malibu, California, Sea Shepherd ? which has had a number of celebrity backers such as Pierce Brosnan and Martin Sheen ? has been involved in numerous anti-whaling and environmental protection actions in international waters. In 2006 Watson was involved in a "daunting chase" when his boat for weeks pursued a Japanese whaling fleet over 4,000 miles along the Antarctic coastline. 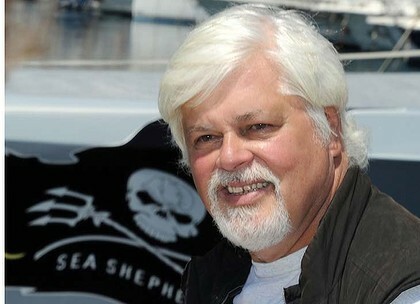 Sea Shepherd said: "Captain Paul Watson was arrested on 12 May and has made contact from Frankfurt airport jail. He has been given periodic access to his mobile phone and is being treated well. "A fisherman accused Paul of trying to kill him, although it is evident that Paul did not and that evidence is on film. He said the warrant dates back to an event in 2002." "With Costa Rica's rich biodiversity, it would be a travesty for them not to stand up for sharks, which sit at the highest levels of the food chain assuring balance among ecological communities in the ocean," Sea Shepherd said. "Paul is very touched by the concern on Facebook and Twitter and finds it very encouraging." 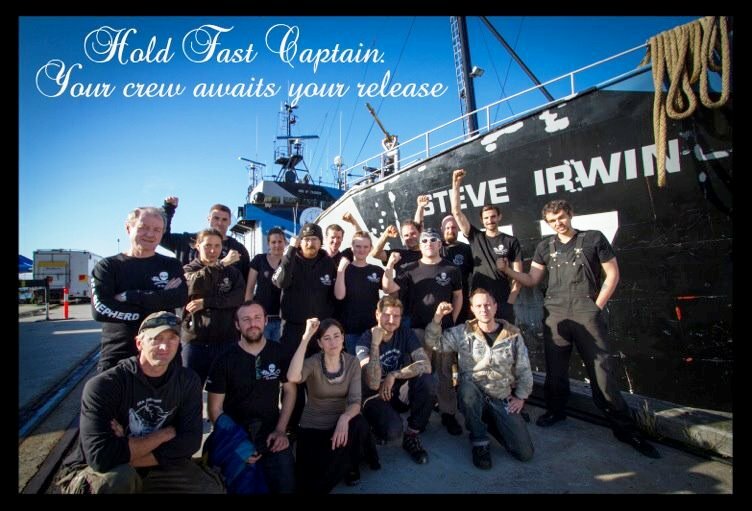 Paul Watson's crew eagerly await his return after being arrested in Frankfurt, Germany. A German court has ordered #Paul_Watson, the founder of the #Sea_Shepherd Conservation Society, to remain in custody a day after his arrest on a warrant from Costa Rica. The veteran anti-whaling campaigner, a Canadian national, was detained in Frankfurt on Sunday on charges stemming from a high seas confrontation over shark finning in 2002. He is accused of having "put a ship's crew in danger" in the incident, a Frankfurt prosecutor said. Watson's lawyer Oliver Wallasch said after a hearing on Monday that his client must remain in custody until the Costa Rican extradition request is considered, adding that he did not know how long the process would take. "My client is shocked," Wallasch said. A media report in Australia, citing Costa Rican reports, said he also faced an outstanding warrant for attempted murder during the same incident. "The German police have said that the warrant for Captain Watson's arrest is in response to an alleged violation of ships traffic in Costa Rica, which occurred during the filming of Sharkwater in 2002," Sea Shepherd said. The specific "violation of ships traffic" incident took place in Guatemalan waters when Sea Shepherd encountered an illegal shark finning operation, run by a Costa Rican ship called the Varadero, it added in a statement. "On order of the Guatemalan authorities, Sea Shepherd instructed the crew of the Varadero to cease their shark finning activities and head back to port to be prosecuted," the group said. It claimed that while escorting the Varadero back to port, the tables were turned and a Guatemalan gunboat was dispatched to intercept the Sea Shepherd crew. "The crew of the Varadero accused the Sea Shepherds of trying to kill them, while the video evidence proves this to be a fallacy," said the group, which was set up in 1977 to campaign against the slaughter of ocean wildlife. "To avoid the Guatemalan gunboat, Sea Shepherd then set sail for Costa Rica, where they uncovered even more illegal shark finning activities in the form of dried shark fins by the thousands on the roofs of industrial buildings." Watson was being assisted while in custody by European Parliament members Daniel Cohn-Bendit and Jose Bove, Sea Shepherd added. "Our hope is that these two honourable gentlemen can set Captain Watson free before this nonsense goes any further," the group said. Sea Shepherd is best known for its annual pursuit of the Japanese whaling fleet in Antarctica, using increasingly militant ways to halt the hunt. This year, after setting off from Australia, the group hurled stink bombs at the boats on the high seas and used ropes to try to tangle their propellers in a series of exchanges which saw the whalers retaliate with water cannon. The whaling fleet killed less than a third of the animals it planned to because of the sabotage attempts. Mr. Watson’s attempted murder charge in Costa Rica stems from a bizarre situation that unfolded en route to Isla del Coco, in the Pacific coast of Costa Rica, back in 2002. Mr. Watson and his organization was actually invited by Elizabeth Odio Benito, who was Minister of the Environment at the time, to come to our country and join the fight against shark fin poachers. Mr. Watson arrived on the Farley Mowat, a vessel named after the Canadian naturalist, to Puntarenas. Mr. Watson was in command of the Farley Mowat when he allegedly rammed a Costa Rican boat suspected of illegal shark fishing. That happened near the territorial waters of Guatemala, and Mr. Watson claims that he was instructed by Guatemalan authorities to detain the Tico fishermen, which he did. After the ramming and subsequent towing of the boat, Guatemalan authorities told Mr. Watson on radio that he would be arrested for his conduct in the high seas, so he instead released the Tico boat and changed course to Costa Rica in order to avoid arrest. According to a 2002 article in The San Francisco Chronicle, the Tico fishermen then claimed that Mr. Watson’s crew attacked them when they were adrift and engaged in mechanical repairs. They claim that the Farley Mowat crew used water cannons and pyrotechnic flares on them. Once Mr. Watson arrived in Puntarenas, it took some time before the local prosecutor ordered a ship arrest while an investigation was conducted. The Farley Mowat was freed on a bond of $850, and Mr. Watson’s attorney advised him to sail away and flee Costa Rica while he could. Video of the events which have given rise to the current arrest warrant. Collision with illegal shark fishing boat off coast of Costa Rica. PETITION being promoted on behalf of Captain Paul Watson of the Sea Shepherd Organisation. Government Official in Costa Rica Comments on Paul Watson’s Arrest. The Vice Chancellor (Roverssi) underscored Costa Rica’s leadership in her efforts to eradicate shark finning, as well as in matters related to fishing and the sustainable use of aquatic natural resources. “Costa Rica, along with other countries in the region, has undertaken significant administrative, judicial and political efforts to eradicate that repugnant practice (of shark finning), and will continue to assume a strong position of condemning such violent attacks against nature”, assured the Vice Chancellor. Regarding the detention of Mr. Watson, the Vice Minister preferred to not comment on the matter since it is a proceeding that belongs to judicial branch, and the separation of powers must be respected at all times. He pointed out that the matter took place back in 2002, and thus the present administration -which assumed office in 2010- does not have to take a position on a matter that belongs in the courts. In Germany, the Deutsche Welle (DW) reported that Mr. Watson had his day in German court on Monday, and he was ordered to remain in custody. Mr. Watson’s attorney stated that his client was shocked. According to the DW, Mr. Watson is enjoying the assistance of two members of the European Parliament while he is in jail. In the past, Mr. Watson has faced prosecution in his native Canada and Norway. According to the Australian Broadcasting Corporation, Mr. Watson was placed on an Interpol wanted list in 2010. 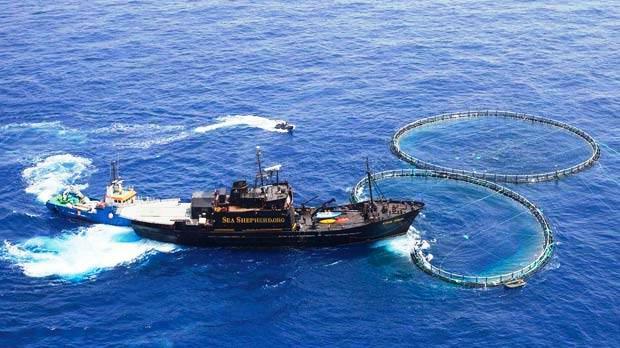 The Sea Shepherd Steve Irwin vessel (named after the Australian naturalist) skippered by Paul Watson previously cut nets belonging to illegal tuna fishermen off the coast of Malta. The ship was arrested in Shetland last year as a result of the incident but was later released following the raising and payment of a substantial surety to the Scottish authorities. A case for damages following the incident is being brought by Fish and Fish, a Maltese fishing company and will be heard at some time in a London court. Paul is doing some really magnificent work along with his crews on the other boats and those who give their time on land to support the crews. The work they do is not rivalled by any other organisation. Even Green peace do not have the capability to do what Paul and his organisation does in trying to save the whales from extinction. I do hope the German authorities show the same common sense as Interpol and will not entertain this ridiculous manufactured warrant. I enjoy watching the programme on the Discovery channel. Those people are so brave to go down to the Southern Ocean and fight the Japanese whale killers. They have my support for sure. An excellent story and a most worthy cause to highlight. Paul Watson and his volunteers do a wonderful job all over the world whether it be the protection of baby seals in Canada, pilot whales in the Faeroe Islands, humpback whales in the Southern Ocean or blue-fin tuna in the Mediterranean. Very interesting John and thank's for highlighting this .... best of luck to Paul Watson and I am ashamed I had never heard of Sea Shepherd. I have signed the petition and I am going to familiarise myself with the subject .... the Japanese should be boycotted until they stop commercial whaling ... nasty little fuckers. (I mean the whalers of course, not all Japanese before Preece starts stalking me in Japan too!). Jackie why don't you direct your vicious rants at something like this Paul Watson injustice rather than idolising a child killer who doesn't want to know you and never thanked you for working for him 24/7. I would have suggested the Simon Hall case but noone wants you anywhere near that! VERY VERY VERY VERY VERY VERY IMPORTANT: It is critical that we send as many emails as possible to Germany's Federal Minister of Justice to overturn the decision to extradite Paul to Costa Rica. PAUL NEEDS YOUR HELP!!!!!!!! Please do not fail him! Costa Rica confirms Watson extradition demand. The Costa Rican government has officially confirmed its demand for the extradition from Germany of hardline conservation leader Paul Watson. 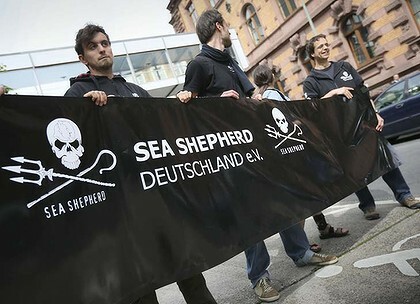 German authorities queried the status of an arrest warrant for Mr Watson, a Canadian, after he was detained at Frankfurt airport, Sea Shepherd spokesman Peter Hammarstedt said. Costa Rica replied that he was wanted over an alleged navigation offence a decade ago, Mr Hammarstedt told Fairfax online. "There is no other allegation against him," Mr Hammarstedt said, dismissing suggestions that Mr Watson faced claims of attempting to kill seamen aboard a Costa Rican fishing boat in 2002. Mr Watson has been held in custody at Frankfurt airport since last Sunday, and in his most recent tweet said: "might have to stay one more night until we clear this up ... "
He is due to appear in a closed hearing again tonight, Australian time. The case stems from a collision between Mr Watson's then ship, Farley Mowat, and the Costa Rican shark fishing boat Varadero in April 2002. At the time, Sea Shepherd was campaigning in the central Pacific against shark finning. After apprehending the Varadero in Guatemalan waters on what Sea Shepherd said were orders from Guatemalan authorities, Mr Watson was prosecuted when he went to Costa Rica. Initial charges were dismissed, but with a renewed prosecution looming, Farley Mowat fled. Mr Hammarstedt said an arrest warrant for Mr Watson had lapsed before it was reactivated last October. This coincided with the commencement of a prosecution against Sea Shepherd by Japan's Institute of Cetacean Research in the US District Court in Seattle, he said. Costa Rica has a recent record of voting against whaling in the International Whaling Commission. Mr Hammarstedt said fishing interests from Japan, Taiwan and other countries maintained a strong presence in central American waters. Costa Rican environmentalists say that, although shark finning is banned there, a trade in dried shark fins from other central American countries passes through its ports. Interpol, the international co-operative policing agency, released a statement in which it said it refused in March to publish a Red Notice seeking Mr Watson's arrest because its Office of Legal Affairs was not satisfied the request complied with Interpol's constitution and rules.